The Redline Route functionality allows users of Event Editor to propose route changes in the linear referencing system (LRS) to the LRS editors through the Redline feature class. Event records can be created using the redlines. For more information, see Adding linear events to a route redline. You can use the following steps to create or edit redline routes. In the Redline Routes group, choose a redline activity and draw a redline on the map. The Redline activity types are user defined and can be added or edited in the Redline feature class in ArcGIS. Coded value domains are used to populate the ActivityType field. For more information on creating coded value domains, see Deploying redline routes or Creating a new coded value domain. The Redline attributes widget appears. Click the Network_ID drop-down arrow and choose the network to which to add the redline. Optionally enter the route ID for which the redline is created in the Route_ID text box. Select an effective date for the redline using the Effective Date calendar tool. The information needed for steps 6 through 10 is optional; that is, you can skip these steps if you do not have the data for these fields. The Activity Type field is populated from the activity selected in step 4, but you can change it using the drop-down list. This selection is particularly useful when you want to edit the records of a preexisting redline feature. Type the route name in the Route Name text box. Type the suggested from measure in the From Measure text box. Type the suggested to measure in the To Measure text box. You can attach files to the redline in the Attachments area. Click Save to save the redline feature you have just created. You can edit a preexisting redline in Event Editor. Click the redline feature on the map to select it. The redline feature will be highlighted on the map and its records will be shown in the Redline Routes widget. 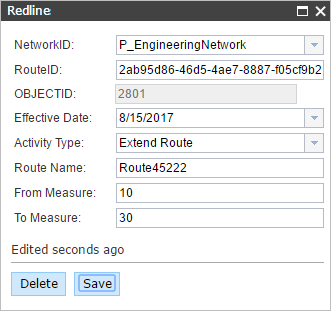 You can change the records of the selected redline in the Redline Routes widget, or you can click the Delete button to delete the selected redline feature. The vertices of the redline feature are now exposed. You can move the vertices to fit in the location you want.